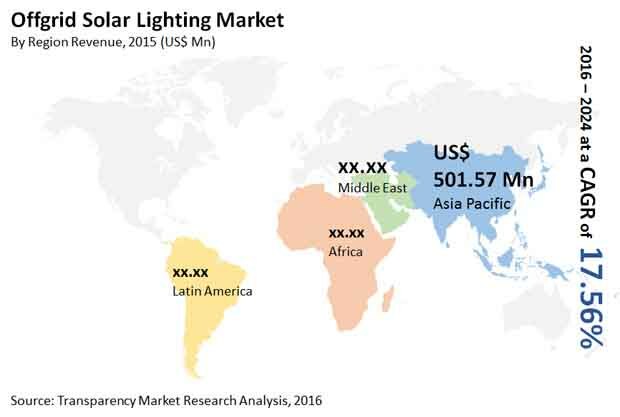 The global off-grid solar lighting market is projected to be fragmented due to the presence of large number of players operating in the market, states Transparency Market Research. The market has a presence of various large, medium, and small-scale players competing against each other. Leading players in the market are engaged in integrating advanced technology, durability, and efficiency in their offerings. In this report, analysts have mentioned few prominent players such as Total S.A., OSRAM GmbH, Koninklijke Philips N.V., SunnyMoney, and various others. As per the data presented in the TMR report, the global off-grid solar lighting market is expected to progress at healthy CAGR of 17.56% between 2016 and 2024. If the market rises at this rate, there are high chances that the market will generate high revenue by the end of forecast period. Based on the type of off-grid solar lighting, the demand for the solar lantern systems is highest among the people. Availability of solar lantern systems at lower cost and fewer constituent systems elements in this system led the demand in this market. In addition, these factors make it easy maintain the solar lantern systems, which boosted its demand in this market. With respect to geography, Asia Pacific marks its presence and might lead the global off-grid solar lighting market in the coming years. Availability of supportive government policies and provision of direct subsidies in this region boosted the growth of the off-grid solar lighting market. Globally the demand for off-grid solar lighting products is rising at a significant rate as people needs better and advanced lighting options. In several regions, especially in developing regions people are highly dependent on natural fuels such as wood, kerosene, and coal. But the use of these sources have an extreme adverse effect on the environment. Therefore, off-grid solar lighting products have been introduced that will help in minimizing the effect of these natural fuels and increase the demand in this market. Moreover, governments in various regions are also making consistent efforts to increase customer awareness about the advantages of these products. They are also providing funds to off-grid solar lighting products developers and reducing tax exemptions to encourage them to develop more products at lower prices. Considering all the above-mentioned factors the demand in for off-grid solar lighting products is expected to rise significantly in the near future. The global off-grid solar lighting market is likely to experience high growth in the next couple of years, but lack of customer awareness about this product might hamper the growth in this market. In addition, limited availability of finance and weak distribution channels are few other restraining factors that are expected to deter the growth of off-grid solar lighting market. However, decreasing cost of off-grid solar lighting products and high prices of kerosene especially in developing regions are likely to expand the demand for off-grid solar lighting products in the near future.